It must have irked one of the best designers of our time Jony Ive to no end seeing that when you unlock his industrial metal-and-glass marvel, the iPhone, you get to see iOS the way Scott Forstall envisions it. Faux linen background in the pull-down notification bar, stitched leather notepad. It is called skeuomorphism and supposedly comforts users with familiar images for their tasks that they are used to from the physical world, but a reel-to-reel tape in the Podcasts app? Steve Jobs, with his calligraphy background and artsy escapades was a big proponent of skeuomorphism, which spilled over to his iOS chief and protege Scott Forstall as well, and never left. The world, however, is moving along, and today's kids would hardly ever crack a book with covers even, let alone use a paper calendar, or be soothed by a tape reel image. Now with Jony Ive in charge of the design&software synergy at Apple, he can finally apply his award-winning paradigms to iOS too. Sources from Apple said for the New York Times that this unwillingness to change and bow before Sir Jony Ive's vision was one of the main reasons Tim Cook had to let Scott Forstall go, not just the popularized Maps apology fiasco. Hardly anyone can argue that Apple has been at the forefront of handset design lately, coming with unique propositions, while the laggard has been precisely the iOS look and feel, all masked under unsubstantiated arguments of "user simplicity" and "familiar look and feel." Microsoft, which was not known for taking huge gambles, offered its users such a drastic user interface overhaul with Windows 8, tearing down the past, and reports as far back as September told about internal struggles at Apple giving this overhaul as an example for ditching skeuomorphism for the most part. As a design trendsetting company, the proponents argued, Apple should rise up with something more creative. We can only imagine the concepts Jony Ive has mentally lined up for iOS going forward, just waiting for a chance to apply them one day, and with the trust laid upon him by CEO Tim Cook, now he has a free pass to do so. Next year is a software year for the iPhone, as this edition just underwent a design overhaul, so are looking forward to some real UI race between Android, iOS and Windows Phone, all for our amusement and benefit. skeuomorphism or not? That's garbage discussion. Tim Cook wants to get rid of Jobs's influence so he would find a way and Ive is a great card for Cook to play to show the "first in line to be CEO" Forstall the exit door. By the way what iOS lacks is not this style or that style. It's multitasking idiot. I have been wondering what a new iOS UI would look like. The row of icons is soo 2007. Maybe they do a tiled UI similar to WP? After all, MS's tiled UI goes back to Windows 2.0 that was built under a license from Apple.... Nothing like going retro. GM, Ford and Chrysler did it. Apple can too. Another UI idea would be to merge the Mac OSX UI? A row of icons on the bottom of the screen that can be flicked left or right? PA, I just gave you and idea for a new article.... Give me credit if you take the idea and run with it. Correction - an idea. Like the edit after posting fix, but maybe 300 seconds? One more correction - The grid of icons (in the first paragraph). Dude, it's okay. I don't think any grammar whores are here today. Because people who spend hundreds of dollars on a smartphone naturally look for reasons to defend their purchase. How can they possibly simplify something so simple? I would think it needs a little more cool features and makeover to keep up with the competitions constant new features and tech. Eh, I wouldn't say "beautiful hardware". Boring uninspired design taken from other manufacturers, yes, and aesthetically simple, yes, but not beautiful. But yes, ios could use an update, but I don't think that'll convince the millions of users departing it to come back, and may only keep the non-diehards around a bit longer. That said, it is difficult to imagine anything new or imaginitive coming from apple with Ive in full control of design. We'll just see more Dieter Rams-inspired shapes, nothing we haven't already been bored with for 5 years. The originals were much better, especially as they were so unique and interesting when they came out so long ago, long before most of us were born. I actually like the hardware design of the black iP5. I just think a 4 inch screen footprint is too small. And the case is too vulnerable to scratches. Somebody please ask Phone Arena when they will quit giving Johnny Ives "favors". For the man's sake, he designed a square with rounded corners, for which ten or more companies designed first, Sony and LG included. This clown just ripped it off. You people are so on this guy's lap, it's rediculous. I am a big Android guy, you could say I am anti Apple...But I also think this is a good idea. I also gave this a thumbs up. 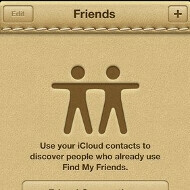 I think its time for Apple try to something different with iOS. Didnt they do something different with OS X a few years ago? I dont consider myself a fanboy, I do agree with some pro Apple posts here n there. Something's in the air tho....cuz I have been agreeing with a few pro Apple posts over the past few days...lol. LOL sorry had to laugh. What ever this guy comes up with its still not as good as sony designers. Go to Japan and learn what design truly is. Pce!! The ppl that bought us the Playstation, PS2 and PS3. They bought us the Walkman, that lil thing that was out before the iPod that everybody n their grandmother had back in the day. japanese phones on paper seems to be very good but once release in the international market, critics tend to give only good to bad reviews. and they don't sell very well, maybe japanese phones are over hype. The topic is in regard to the OS design not the device. If what you ment was indeed OS?UX design of SONY in my personal opinion it ain't any better than what we see in iOS. +1 What we should wait for is what his minimalistic approach would do to iOS. Sorry, Katrina. Everybody needs to go to Korea to learn what design truly, truly, truly is. Apple of America has failed you. Sony of Japan failed you. Bow before the new king--KOREA! It'd be interesting as to what degree they'll tweak iOS since I believe simplicity is it's main strenght. I would like to see some kind of different theme to iOS, something like interchangeable themes of some sort. . . I actualy liked textured design more then "clean" one. There has to be a line before sterility. This was exactly what I was trying to say in another article. Jony Ive is now the overall chief designer of both hardware and software and I can see a very flat iOS interface under him. Tweaks here and there to make things look and feel simpler will put less load on the CPU/GPU so I believe the next iPhone would be even faster (not just because of a faster chip). Except speed hasn't been the issue(s) with iOS, features and functionality are. A hardware designer isn't going to fix that, only make them look more industrial in appearance. Um, it doesn't take more processing power to draw an image of the same resolution presuming that the access to internal programmed color palettes are equivalent (and I see no reason they wouldn't be). Now if it were drawing a low-res image, yes, that would speed up the load/draw time somewhat, but not hugely so. But that would be the rough equivalent to the differences between something made in MIcrosoft Paint versus Adobe Photoshop.